Hosna J. Shewly‘s “Abandoned spaces and bare life in the enclaves of the India–Bangladesh border” in the January edition of Political Geography looks at spaces abandoned by the state, but still subject to other state powers, and their production of “bare life,” Giorgio Agamben’s term for what happens when state power strips a person down to just being a body, a “life exposed to death.” In short, the article is about how liminal discarded spaces work via exclusion and control to politicize life in a certain way. Shewly shows how abandonment by the state is not just a leaving behind of something, but the creation of a type of violence. Abstract: Based on an ethnography of the enclaves in India and Bangladesh, this paper explores enclave dwellers lived experiences of vulnerability where life is trapped in-between two states. These enclaves are geographically located in one country but politically and legally belong to another. The absence of a home country’s rule of law and the irregular presence of the host country’s sovereign power and control construct, in Giorgio Agamben’s terms, a ‘space of exception’ where everyday life is characterised by exclusion from legal rights, but nonetheless subject to law, socio-political exploitation and gendered violence. By situating Agamben’s ‘bare life’ in these enclaves, this paper argues that the conceptualisation of bare life as solely a sovereign production paints an inadequate picture of the zone of abandonment. The paper argues that in addition to the sovereign creation of bare life, social and gendered dimensions are essential for a nuanced approach to this concept. 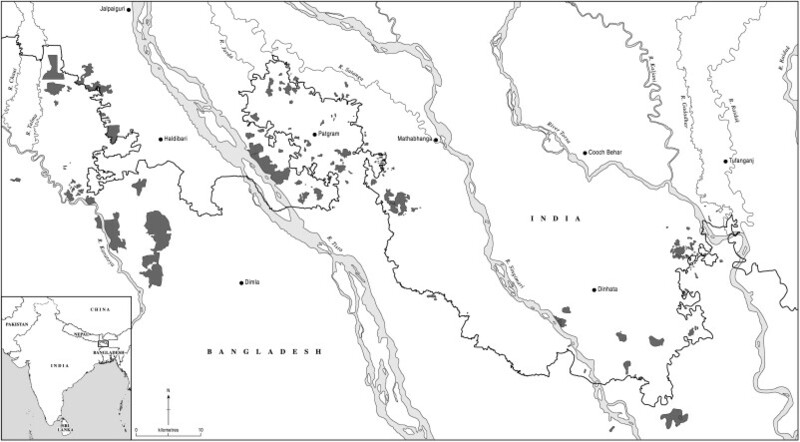 The enclaves in India and Bangladesh. Image from article. This entry was posted in Difference: Class, Race, Gender, Government, Waste, World. Bookmark the permalink.